The following links are for employment statistics regarding small engine and motorcycle repair at the Bureau of Labor Statistics website. Penn Foster – Penn Foster offers course’s in small engine repair online and through snail mail. You can complete the Penn Foster Career School Small Engine Repair training program in as little as four months — all from home and at a pace that’s right for you. Plus, as a Small Engine Repair course student, you’ll receive discounts on tools and supplies through the Snap-on Student Excellence Program. Stratford Career Institute – Offers online courses in motorcycle repair.Learn more about small engine repair with Stratford’s home study course. Stratford’s Small Engine Repair course carefully details the many systems, tools, and parts involved in successful repair and also covers performance measurement and preventative maintenance. In addition, students will also learn more about career opportunities in this line of work. Walla Walla Community College – Located in Walla Walla, Washington. The Outdoor Power Equipment Technician Program provides intensive career preparation through interactive web-based classroom instruction with live shop, hands-on application either on-campus or off-campus, with the off-campus students learning in on-the-job environments. The program is certified by the national Equipment and Engine Training Council (EETC) and is led by an EETC certified instructor. Students prepare technical knowledge and mechanical skills necessary to service, troubleshoot and repair today’s sophisticated recreational, residential and commercial outdoor power equipment using the competencies and national testing provided by the EETC. Training materials and equipment are provided through cooperative agreements with regional dealerships, national manufacturers, and the local community. Curriculum is reviewed by the Outdoor Power and Turf Equipment Technician advisory board which is composed of local and regional industry members. Iowa Lakes Community College – Located in Iowa. The Powersports & Power Equipment Technology program is designed to prepare you for employment in the repair of lawn and garden equipment, snowmobiles, personal watercraft, all-terrain vehicles and both American and foreign motorcycles. Motoring Technical Training Institute – Located in Massachusetts. Do you love to ride or work on motorcycles? Do you want a successful career working in the motorcycle or small-engine repair industry? Life is much more fun doing something you enjoy! Come to MTTI’s Motorcycle and Power Equipment Technician program to prepare for your new career, today! Autry Technology Center – Located in Enid, Oklahoma. Learn troubleshooting and repair techniques for various types of small engines including motorcycles, lawn equipment and ATVs. This course covers testing for malfunctions, disassembling of engines and examination, repair and replacement of parts. Hennepin Technical College – Located in Minnesota. Do you want to turn your interest of boats and motorcycles into a career? Then HTC’s Marine/Motor Sports Technology program can help you move in the right direction. As a marine, motorsport and outdoor power technician, you will troubleshoot and repair equipment found in the boating, powersport , motorcycle, lawn and garden, and industrial engine industries. In this program, you will gain the knowledge and hands-on experience you need to move ahead. Red Rocks Community College – Located in Colorado. Austin Community College – Located in Austin, Texas. This program will provide power mechanics technology training in the principles and operation of two and four cycle small engines, electrical systems, engine failure analysis, tune-up, hydraulic principles and extensive laboratory experience. It encompasses equipment that is powered by small engines, i.e., lawn mowers, grass trimmers, and chain saws. 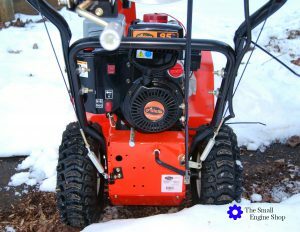 It covers cutting deck mounting, height and drive belt adjustments. It also includes gear case overhaul, and chain service and repair. New Castle School Of Trades – Located in Ohio, Pennsylvania and Maryland. Our motorcycle and power equipment mechanic school delivers the skills you need to work with small engine systems. Training includes experience with PWCs, ATVs, dirt bikes, riding tractors and more. Salt Lake Community College – Located in Salt Lake City, Utah. The Motorcycle/Outdoor Power Equipment Technology program at SLCC is great for both career-minded students and hobbyists who love to work with their hands and have a passion for motorcycles and other types of small engines. College of Western Idaho – Located in Idaho. The need for repair technicians specializing in powersports vehicles and small engines has skyrocketed in recent years thanks to the overwhelming popularity of power toys, recreational vehicles, and motorized small vehicles. Small engines present a fun troubleshooting challenge and, in our program, you will learn to repair everything from dirt bikes to the latest lawn-care equipment. Our graduates learn skills in many types of repair, from vintage engines that customers want to keep forever to the latest computerized, high-end components. This is a two-year program that will give you skills for a lifetime of employment working for yourself or someone else. Hagerstown Community College – Located in Hagerstown, Maryland. Whether for fun or profit, you can service small engines found in lawn equipment, motorboats, snow blowers, or garden equipment. Hands-on shop activities and expert instruction will introduce you to the principles of two-cycle and four-cycle engine operation, fuel and exhaust systems, ignition components, lubrication systems, and cooling systems. A list of tools needed will be distributed at the first class and appropriate safety clothing is required for shop activities. Reading Muhlenberg Career And technology Center – Located in Reading, Pennsylvania. Acquire the skills necessary to obtain knowledge and hands-on experience to work on today’s sophisticated vehicles. Dan’s Online Motorcycle Repair Course – FREE online motorcycle repair courses. Stratford Career Institute – Offers online courses in motorcycle repair. Whether you love riding ATVs and motorcycles as a hobby, or want to work toward a career in ATV/motorcycle repair, Stratford’s course can help you get started. Penn Foster – Penn Foster offers course’s in motorcycle repair online and through snail mail. If you want to learn how to become a motorcycle mechanic, Penn Foster Career School is the place to start. You can earn your Motorcycle Repair Technician Diploma in as little as four months – all at home, and at a pace that’s right for you.Courses in this program can teach you to maintain and repair motorcycles, giving you the skills that can help you get started on your career path or work on your own motorcycle. Ashworth College – Online courses in motorcycle repair. Motorcycle Repair training online will help you turn your passion for bikes into an exciting career. Rev up your future with professional motorcycle repair training that teaches you how to troubleshoot two- and four-stroke engines, repair and replace components and get bikes up and running. Power Sports Institute – Located in Cleveland, Ohio. The PowerSport Institute (PSI) is a branch campus of Ohio Technical College dedicated to providing motorcycle mechanics training in Ohio on a wide array of manufacturers and equipment in the powersport industry. Never before has so much training been combined into one comprehensive program. Wyotech – Located in Daytona, Florida. WyoTech’s Motorcycle Technology program is designed to give you the specialized skills and knowledge you need for a career servicing and repairing today’s modern bikes.Whether you’re interested in basic motorcycle repair or looking to hone your skills with a specific motorcycle brand or style, WyoTech offers the hands-on experience that can put your future on the fast track. Fort Scot Community College – Located in Fort Scott, Missouri. Harley-Davidson Motorcycle Technician TrainingA partnership between Fort Scott Community College and the Harley-Davidson Motor Company® allows students the opportunity to gain valuable, hands-on motorcycle technician training in a shop environment in addition to learning the theory needed to be successful. Central Carolina Community College – Located in North Carolina. The CCCC Motorcycle Mechanics program is the only one in North Carolina that is factory supported. Major manufacturers support the program through the donation of equipment and instructional materials. CCCC was the first college in North Carolina to offer the motorcycle curriculum. The program was developed with the assistance of industry leaders. Motorcycle Mechanics Institute MMI – Located in Orlando, Florida and Phoenix, Arizona. Street bikes, sport bikes, dirt bikes – Motorcycle Mechanics Institute (MMI) has them all. You will learn motorcycle theory, engine troubleshooting and diagnosis, drivability, and performance testing on leading brands in the industry. Western Iowa Tech Community College – Located in Sioux City, Iowa. The popularity of motorcycles has increased dramatically in recent years. Motorcycles are used by a wide variety of drivers for commuting, weekend touring, and racing. With the increasing cost of gasoline many people are choosing to drive a motorcycle due to the fuel efficiency. Based on this popularity there is an increased need for qualified motorcycle/powersports mechanics and technicians. YTI Career Institute – Located in York, Pennsylvania. YTI Career Institute’s Motorsports Technology program is designed to keep you moving and learning with accelerated, hands-on training. The Motorcycle Technology Center has 3 labs consisting of workbenches, fully equipped tool chests, motorcycle lifts, pneumatic tool connections, exhaust gas removal, and diagnostic equipment plus a stocked Parts Department and a dedicated room for the DynoJet dynamometer for advanced diagnostic and performance evaluation. Come see it for yourself and meet our industry-experienced instructors. Chattahoochee Technical College – Located in Georgia. Georgia Piedmont Technical College – Located in Clarkston, Georgia. Do you love motorcycles? Think you’d like a career in the industry? Georgia Piedmont Technical College has the program for you! GPTC offers a daytime diploma program that students begin Summer quarter each year and is offered only at the Clarkston Campus. Washtenaw Community College – Located in Ann Arbor, Michigan. This purpose of the Motorcycle Service Technology I program is to provide the student with fundamental certification as a motorcycle technician. The student will receive skill training in service department operations, vehicle set-up, mileage-based maintenances, and damage repair estimating. Areas of instruction include; troubleshooting, diagnosing, servicing, and the repair of primary and final drive systems, transmissions, brakes, suspensions, electrical, and induction systems. The program will provide the skills for the student to test for the State of Michigan Motorcycle Mechanics License. Lake Washington Institute of Technology – Located in Kirkland, Washington. Gain a broad range of high-demand technical skills while working on models of equipment serviced in the power equipment, marine and motorcycle industries. Learn to maintain, troubleshoot and repair power equipment from marine engines to motorcycles. Students have the option to specialize in one or more areas after completing basic instruction. Pickens Technical College – Located in Aurora, Colorado. This program is designed to cover basic elements of the Motorcycle Service Technology trade to gain competency for entry level employment in the industry. The students will learn basic mechanical theory, vehicle system service and repair, engine overhaul procedures, trouble shooting, diagnostic procedure and electrical theory. Shop management, design and business practices are an integral part of the program. The focus of Power Sports Technology is motorcycles, snowmobiles, all terrain vehicles and personal watercraft. Cedar Valley College – Located in Dallas, Texas. Do you like working with your hands and taking things apart? Do you love tinkering with your motorcycle or boat but wish you knew more about it? Austin Community College – Located in Austin, Texas. This certificate provides power mechanics technology training in the principles and operation of motorcycle two and four cycle engines, electrical systems, engine failure analysis, tune-up, hydraulic principles and extensive laboratory experience. It covers motorcycle chassis mounted equipment. It includes, brakes, wheels and tires, clutches, drive chains, and transmissions. City College of San Francisco – Located in San Francisco, California. The custom motorcycle technician program will enable the aficionado and those seeking employment to acquire the theoretical and “hands-on” skills necessary to work on all types of motorcycles. No matter what type of motorcycle, this program prepares individuals in a comprehensive study of all pertinent systems and functions. All important in a technician training program is the opportunity to experience many types of conditions and actual repair/maintenance strategies. Having your own motorcycle is encouraged but by no means required. What is required though, is a recognition of the passion and love of motorcycles. Chattanooga State Community College – Located in Chattanooga, Tennessee. Motorcycle and marine engines are becoming more sophisticated and require technicians to have extensive technical training. Motorcycle and marine engines are a separate technology from automobile or diesel mechanics. The motorcycle service industry includes ATVs, dirt bikes and street bikes. The marine service industry relates to bass boats, pleasure boats, PWC (personal watercraft), and cruisers. While all have similar maintenance and repair requirements, all can develop unique problems that test the expertise of the technician. Prince George’s Community College – Located in Largo, Maryland. Are you looking to learn how to service and repair your motorcycle for top performance and safety? Southeast Community College – Located in Nebraska. SCC’s Motorcycle, ATV & Personal Watercraft Technology program prepares technicians for work in independent repair shops, dealerships and specialty shops. Tennessee College of Applied Technology – Located in Paris, Tennessee. The mission of the Motorcycle/ATV Repair Program is to prepare the trainee for entry into the vital repair and service aspect of this growing power sports industry. It is designed to meet the needs of both the trainee and their potential employer by equipping the student with the skills, knowledge, and confidence to enter the Motorcycle/ATV repair field. ForsythTech Community College – Located in Winston-Salem, North Carolina. Students will take courses covering welding and cutting processes, engine preparation and chassis fabrication. Topics include shop safety, transmissions, electrical and fuel systems, and other related topics. What Happened To The 1971 Harley Davidson FLH Owned By Elvis Presley? Copyright © 2019 The Small Engine Shop. All Rights Reserved.